A few years back I went on a bit of a kick about Choice Privileges, the loyalty program of Choice Hotels International. My conclusion was that while the program wasn't for me, its very low starting redemptions (just 6,000 points per night) and decent earning potential on the Barclaycard Choice Privileges Visa made it a decent option for some folks under some circumstances. One of the key problems with the program was their terrible award availability, since they allowed non-elite members to book award nights just 30 days in advance, which basically required non-elite members to book backup reservations at other properties in the hopes award space would still be available when the 30-day mark came around. The other day, reader rap commented that Choice had changed their award booking policy: now, all members have access to the same 100-day award window. And it turns out, rap was right! I've been plugging in award searches for late November (100 days from now) and have found award night availability in destinations like London, Paris, San Francisco, Tokyo, Copenhagen, Stockholm, Oslo, and so on at virtually every Choice Hotels property in each city, with just a few claiming they're already "sold out." I haven't found a single property charging more than 35,000 points per night, a $350 imputed redemption value if you're earning Choice Privileges points on unbonused spend with their co-branded Barclaycard credit card, which earns 2 points per dollar everywhere. In principle their terms still say properties in Australasia can cost up to 75,000 points per night but I'm not sure which property or properties that is supposed to apply to. I wasn't able to find any such properties in Australia or New Zealand. The most stunning thing about Choice Hotels International is still their comprehensive footprint — they're everywhere. Good award availability and a global footprint makes them worth thinking about for folks who rely on unbonused manufactured spend and don't worry about the perks of elite status (many Choice Hotels seem to include breakfast for all guests anyway, and you can always ask for late checkout). As long as you're willing to speculatively book awards exactly 100 days in advance, I think Choice Privileges has been upgraded from a solid to a great choice for no-frills hotel stays in every corner of the globe. On Monday I wrote for the first time about Choice Privileges, the loyalty program of Choice Hotels International. They have a seemingly generous rewards program, with their Barclaycard-issued Choice Privileges Visa Signature card earning 2 Choice Privileges points per dollar spent everywhere, and reward nights starting at just 6,000 points, but the program is weird enough to explore in depth before diving in. The range of points required for redemptions at Choice Privileges hotels is located nowhere on the Choice Privileges website. But the points required for an award night at any given hotel is not a secret! Anyone can search for Choice Privileges hotels in a given city and select "Choice Privileges Reward Night" as the rate type. You'll see all the Choice properties in the city and their points cost (if rooms are available). "Members who have not yet achieved Elite Status must make their free night reservation personally through the Program Line or through their online account no more than 30 days prior to planned arrival for stays in their country of residence. Sixty days prior to their planned arrival at all other locations worldwide." Needless to say, this is not how most hotel loyalty programs work. Co-branded credit cardholders do get to book nights 50 days in advance, which may allow them to steal a march on non-elite, non-cardholders. It is genuinely weird looking at how many properties this chain I've never had any interest in has all over the world. Use Award Mapper to check out cities you're interested in and marvel at all the little orange dots. "There are no blackout dates. Restrictions, taxes and fees apply. 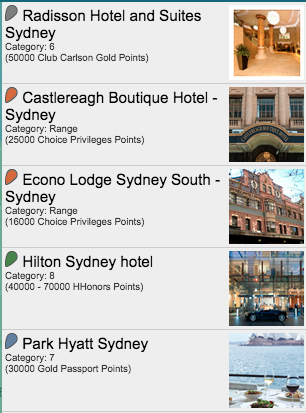 There are over 1,500 Choice hotels with reward nights available at 8,000 points or less. Reward night locations worldwide are available from 6,000 to 35,000 points (excluding Australasia, where reward nights are available up to 75,000 points)." There's no enforcement mechanism. There's no explanation. There's no guarantee at all. And indeed, it can be pretty tough to find award availability at some properties, especially within 30 days. I don't have the same focus on luxury travel many bloggers — and, to be honest, many of my readers — do. But I also don't have the attitude of those who say "I don't care about my hotel — it's just somewhere to sleep." I care about my hotels a lot because I spend a lot of time in them! Hotels are fun! And after spending a week researching Choice properties around the world, I don't think Choice hotels are for me. 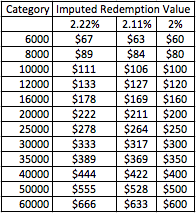 The 16,000 point Econo Lodge (actually the Hotel Harry, an Ascend Hotel Collection member — I believe Award Mapper's Choice Privileges database is out-of-date) wins with a $178 IRV, compared to the Hilton's $222-$259 (depending on season) IRV, the Park Hyatt's $666 IRV (or $300 in Ultimate Rewards points), and the Radisson's $222 IRV. It's easy to find cheaper hotels in Sydney in July (it's winter down there), but in the Southern summer paying $178 for what seems like a perfectly nice downtown hotel will seem like a steal — if you can find award availability at that rate!